I am really excited by the amazing comments & responses I got for my two articles on PN Junction. If you have not read them yet, here they are – 1) Understanding the PN Juction and 2) PN Junction Diode Characteristics. In those 2 articles, I have tried to demystify PN Juction and explain it in very simple words. From those good responses, I assume my attempt has been successful to some extent. In this article, my objective is to take you through the “invention story” of PN Junction diode. Â We are going to see how a pn juction diode came into existence. So lets begin! Â The story of invention revolves around the perseverance of an American Physicist Russel.S.Ohl who discovered the basic form of PN Junction while his research at Bell Laboratories. 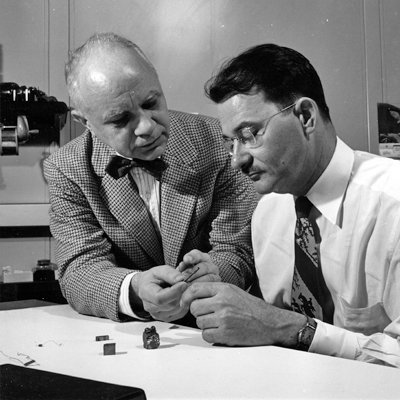 Â Russel Ohl (aka R.S Ohl) was a researcher with AT &T Bell laboratories who specialized in materials research. In 1939, when the world was fully dependent on Vacuum Tubes for the times innovations like Radio, Bell Laboratories was on a mission to find an alternative to vacuum tubes. They sought a better alternative & crystals was a hope for every scientist. Lots of research were conducted on crystals like Silicon & Germanium till 1939 and none of them gave the necessary insight into its properties & behavior. Around the year 1939, senior scientists like Walter H Brattain (one among the trio who invented transistor) of Bell Labs gave upon the crystal research & reached a conclusion that vacuum tubes are the future! Russel Ohl was not very fond of this idea! He was not ready to give up Â his research on crystals and he continued the research on crystals by getting specials permission from Bell Lab seniors. Russel was a material researcher who specialized research on the behavior of crystals under different conditions. Silicon was one his study subjects. All the researches conducted on crystals at Bell Labs were focused on achieving rectification. Crystals always eluded on this property & they were quite inconsistent on their behavior. Â Russel believed this was because of the impurities present in Silicon crystal and he believed in achieving results if he can make the Si crystal more pure. Believing on his idea of purifying the crystal, he continued on the same and finally achieved 99.8% pure silicon. Most of the silicon samples (at 99.8% purity) he tested achieved rectification satisfactorily. He was impressed with the outputs & continued the research in same direction. Every invention has an element of “accidental” in it. The story of PN Junction also has one! One day morning, Russel was inspecting a quirky silicon crystal which had a crack on its middle. The crystal was connected to voltmeter and he noticed a sudden change in voltage (about half volts) when he placed the crystal over a stream of light from a lamp on his table. Now this was something marvelous on those days. No one has discovered such a behavior of crystals before that. Russel demonstrated this behavior of cracked Silicon crystal to his immediate boss Â Mervin Kelly. Kelly who got amazed by this demo, immediately invited Walter Brattain to see the scene. History says the Walter Brattain got stunned by what he saw in the demo, as it was about 10 times of voltage drop he has seen till date. However Brattain was able to gave an assumption on the voltage drop. He assumed the formation of a “barrier” at the crack which might have created a resistance and hence the voltage drop. Further research into the process made everything clear like crystal. The crystal had different levels of impurity on either side of the crack. Â One side of the crystal had an excess of electrons and the other side of crystal had a deficiency of electrons. We all know “opposites attract”, so do the -ves & +ves in the crystal. So electrons started moving from its surplus regions to the deficient region, across the crack. Due to the peculiar nature of the crystal, electrons were able to move only a certain distance across the crack (not over the entire crystal), thus creating a barrier between the surplus region & deficient region. When Russel showed the crystal over light source, the crystal got excited (a kind of forward bias) and the electrons received sufficient energy to move. But this time the barrier created a restriction on free flow of electrons; the barrier allowed electrons to flow only in one direction. So this how the basic form of PN Junction is invented. Further researches have refined the process & methods like doping has been developed to create the barrier (instead of an accidental crack!). Notes:- Russel Ohl was known for the patent he registered on Â modern day solar cells by the name “Light Sensitive Devices”. It was his research on Silicon crystals & the accidental discovery of PN Junction that enabled him to take the research further & invent a basic form of solar cells. this article is very helpful for us…..
in the future make such articles on other basic electronic components also. wow… really interesting story.I am EXTC engineer,but i was not aware about PN junction diode story.really this post boost my knowledge about PN junction diode.Thank You.Keep growing up!